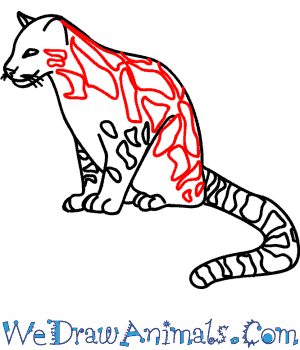 In this quick tutorial you'll learn how to draw a Clouded Leopard in 8 easy steps - great for kids and novice artists. 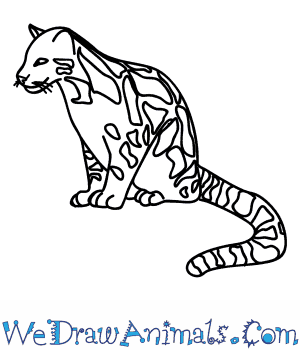 At the bottom you can read some interesting facts about the Clouded Leopard. 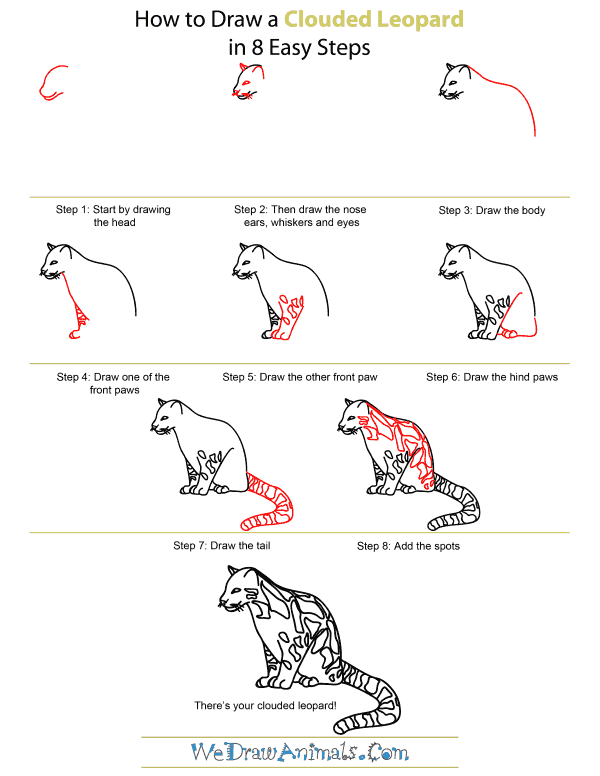 Step 1: Start drawing your Clouded Leopard by drawing a curved dome for the head. The curved line should turn up into a snout, before turning down to make the end of the nose, and curving to the right to make the cheek. From the tip of the mouth, another line should be made that goes down, then curves back to make the lower jaw. Step 2: For the details on the face, draw two lines that come up to a point on the upper left hand side of the head for the left ear. Draw a arching line on the right side for the right ear, and put in a teardrop shape with a flat bottom for the eye. 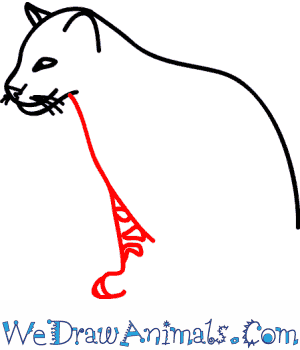 Then put in a forked line above the mouth to make the nose, and a few lines to make the whiskers on either side. Step 3: Now draw the body. This will be a curving line that starts at the back of the head, slanting down and to the right while bending up slightly to make the hump of the back. Then it should curve down to make the rest of the back. Step 4: Now draw the chest and the front leg. 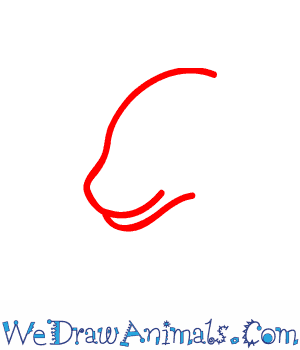 Draw a right slanting, downward line that starts at the back of the chin. This line should curve toward the back, but not be drawn too far. 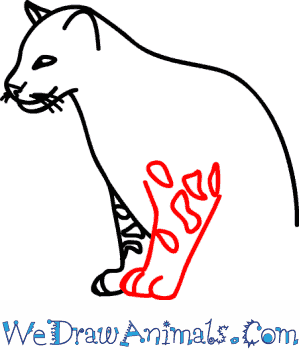 Then add a line that goes directly down from above the curve you've drawn on the chest, that will bend out, then curve around to make the toes of one of the feet. Then draw some spots while making sure to leave negative space for the other leg. Step 5: Next we draw the other leg! Put in two left and downward slanting lines that start far apart, and get closer together. At the bottom the front line should loop around to make the foot. Add a two more loops to add the toes, and connect one of the loops to the back line. Now add spots on the leg. Step 6: Draw a longer line on the back of the leg, going up and to the right. 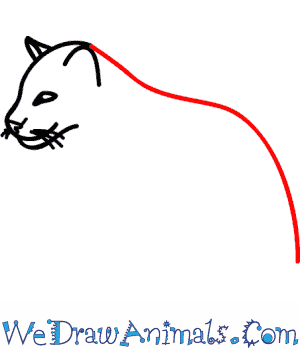 Then draw a line that goes down from the back, and curves to the left to make a flat line. Then put in circles to imply the existence of legs and the feet on them. 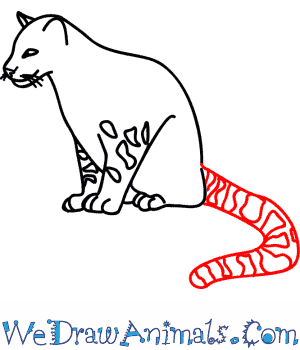 Step 7: Now draw the tail! 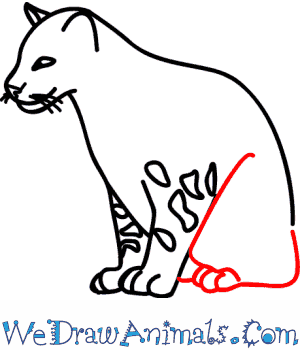 It should be thick, and made with two lines that start on the back of the Leopard, curving once in any direction you'd like. The lines should meet with a wide rounded curve. Make sure to put spots all along the tail too. Step 8: Now add a lot of spots all throughout the body, and you're done! 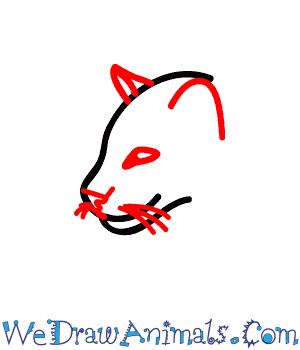 You have drawn your Clouded Leopard. Clouded leopards are a breed of leopards that are native to Southeast Asia. Humans have a hard time finding clouded leopards because they do not make their presence known. Therefore, there is little scientific information regarding their daily habits. Clouded leopards are one of the best climbers of all cats. Clouded leopards have excellent eyesight. A typical diet for clouded leopards includes squirrels, birds, pigs, and monkeys. In comparison to their body size, clouded leopards have the largest canine teeth of all wild cats. Female clouded leopards give birth to a litter of one to five cubs every year. The cubs remain with their mother for 10 months. Female clouded leopards are smaller than males. The average size of a clouded leopard is two to three feet long. They weigh up to 50 pounds. Clouded leopards spend most of their lives in trees. Illegal hunting and deforestation are two causes of the declining population of clouded leopards. Clouded leopards have gray or yellow coats. They have dark brown spots that have a black outline, which helps them to camouflage in the forests where they live. There are four subspecies of clouded leopards, although one of them is thought to be extinct.